I am sure some of you might be Bruins fans and although the Winter Season is over we are fortunate enough in the Boston area to have our Spring spotted with Black and Gold. Every day hundreds of thousands of young athletes head out to the local hockey rink to enjoy, practice, and compete in hockey games and tournaments. There’s no doubt that hockey is a great way for kids and teens to stay healthy, as well as learn important leadership and team-building skills. But there are risks to pushing the limits of speed, strength, and endurance. And athletes who push the limits sometimes don’t recognize their own limitations—especially when they’ve had a concussion. A concussion is a type of traumatic brain injury—or TBI—caused by a bump, blow, or jolt to the head or to the body that causes the head and brain to move rapidly back and forth. This sudden movement can cause the brain to bounce around or twist in the skull, stretching and damaging the brain cells and creating chemical changes in the brain. Wouldn’t it be great to add an extra safety precaution to this beloved sport? Enter the “Look-Up Line™”. The Look-Up Line™ is a warning track extending 40 inches in width around the circumference of the hockey rink. The Look-Up Line™ warning track will be colored orange. This color will not interfere with any other lines on the hockey surface, and orange is a color universally associated with caution. The 40-inch width warning track allows for no overlapping of any face-off dots, lower circles, or hash marks. This will then provide players with information that will warn them, 1. To keep their heads up in order to prevent head and neck injuries, and 2. To be careful not to body check (contact) opposing players from behind. Soon Smith came up with the specifics for the Look-Up Line™ — orange for caution, 40 inches for visibility. 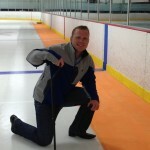 First, it was painted on the rink at Smith’s alma mater, The Pingree School, South Hamilton, MA. Then a modified version of the line was used at Fenway Park in January for four outdoor games involving Hockey East teams. The idea quickly gained notice, and more than a dozen rinks, mostly in New England, have said they will add the line by September. For young players just moving into Bantam levels and others that allow checking, having the Look-Up Line™ in place as they learn this part of the sport could help them adjust as they advance. Moreover, higher levels of hockey, as witnessed at Fenway Park, can implement the line without altering their game much. Prevention is an integral part of the mission at Brain Injury Association of Massachusetts. We wanted to share the story of the Look-Up Line™ to our community and let you know that there are people trying to make advances in preventing head and spine injuries every day. We want adults and children alike to play safe and enjoy doing an activity that they love. This entry was posted in Uncategorized on May 8, 2014 by Brain Injury Association of Massachusetts.